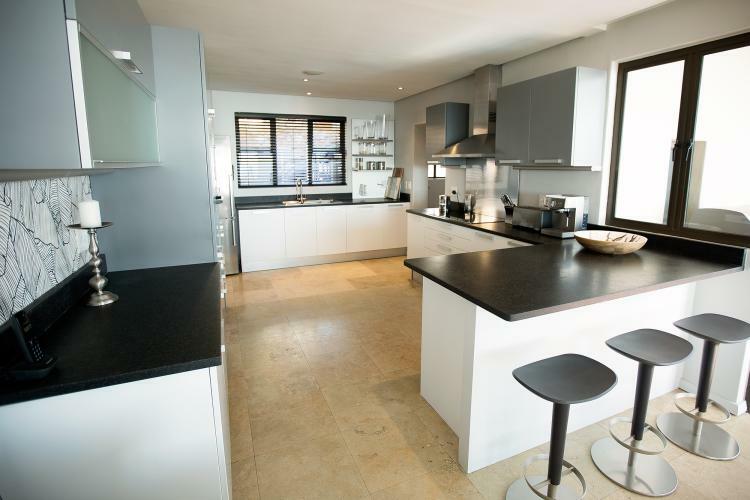 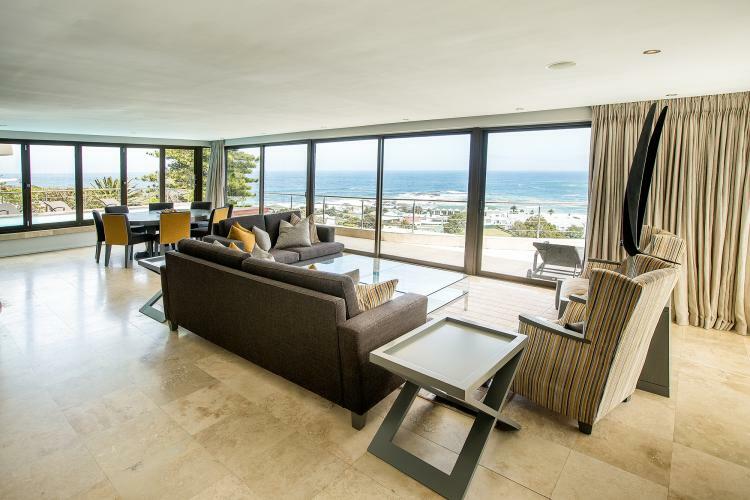 This characterful modern villa is accented with warm, welcoming colours, sculpted African artefacts and large, colourful oil paintings that offset its clean, contemporary lines. 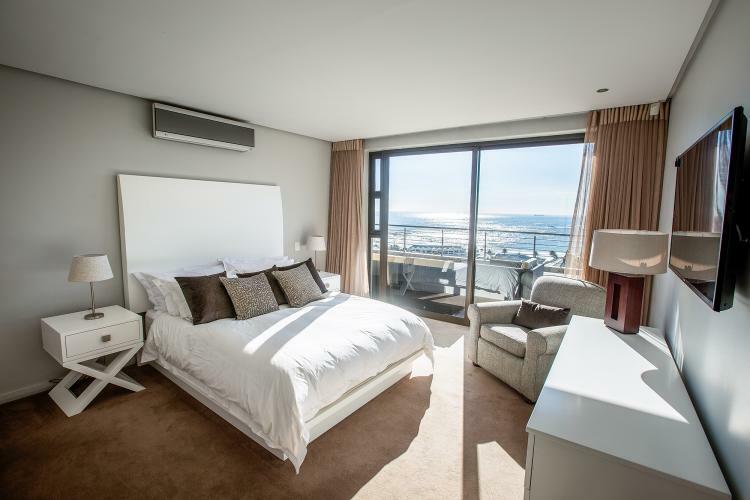 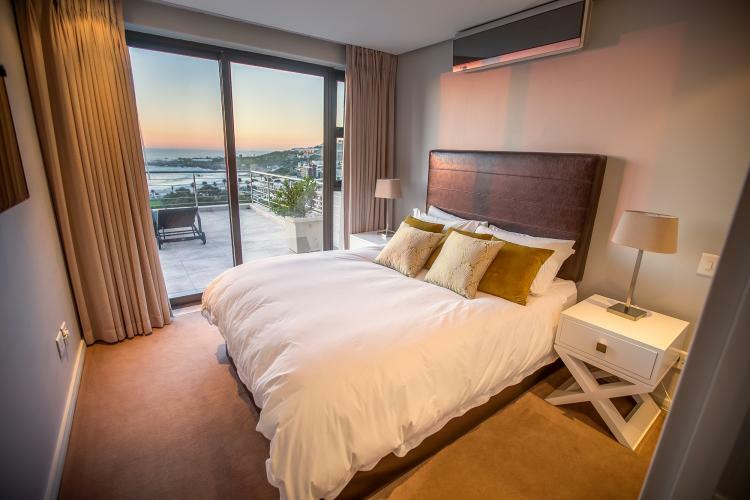 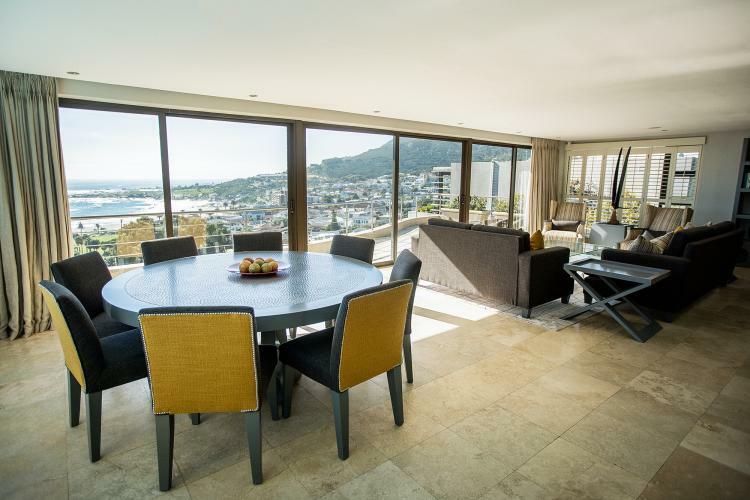 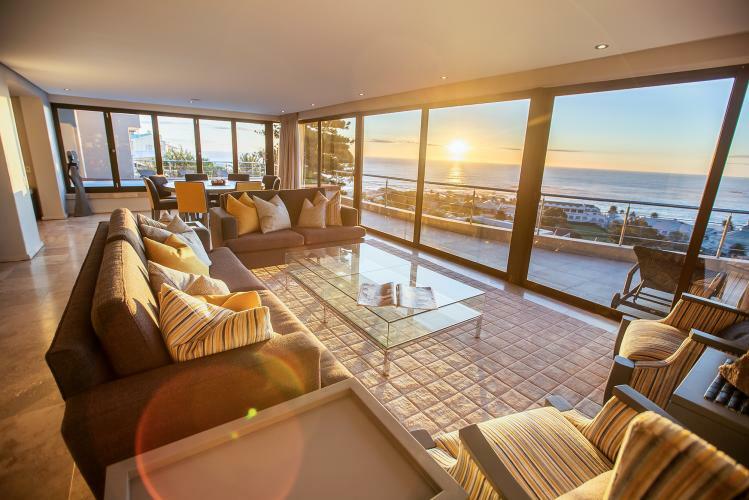 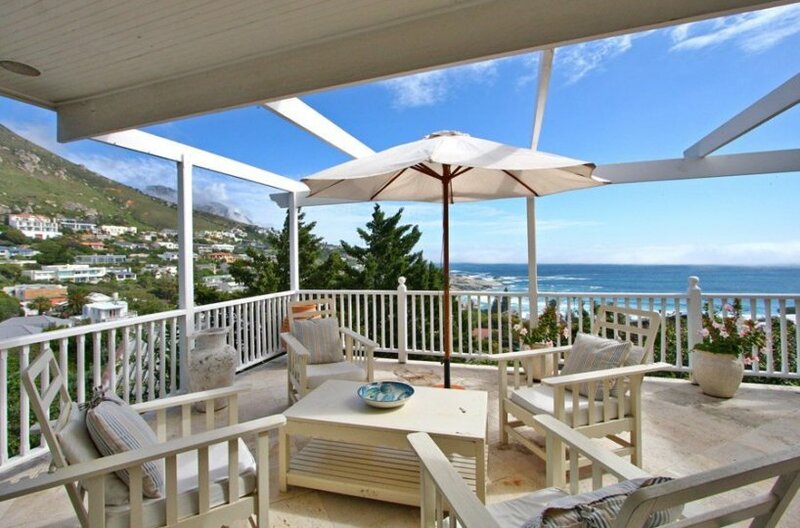 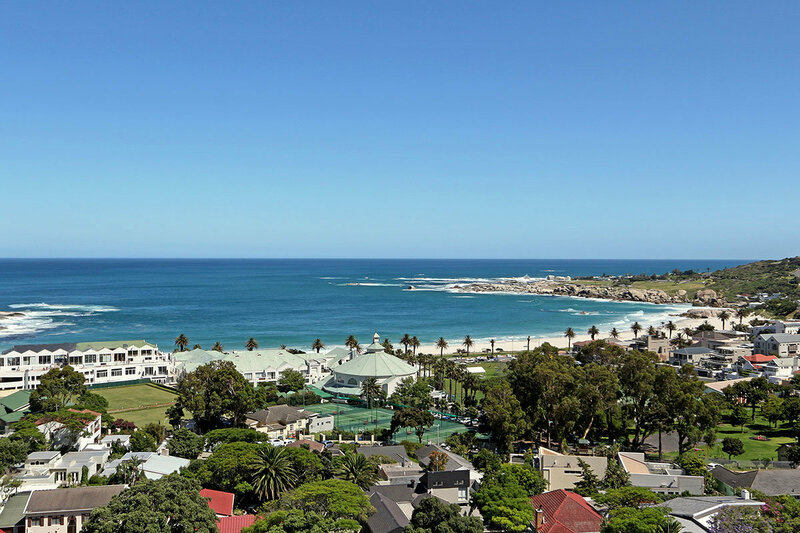 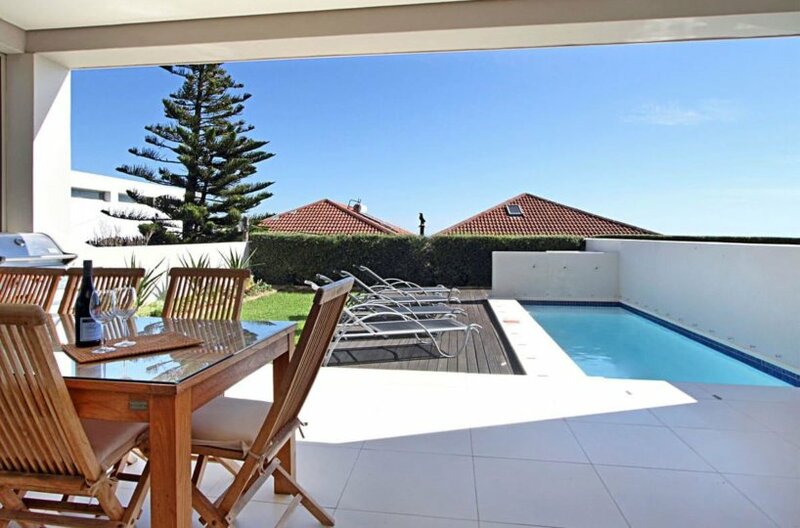 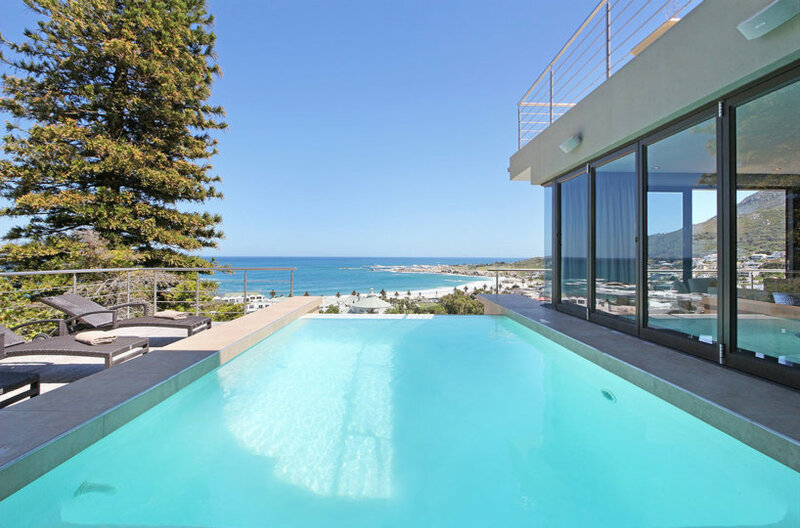 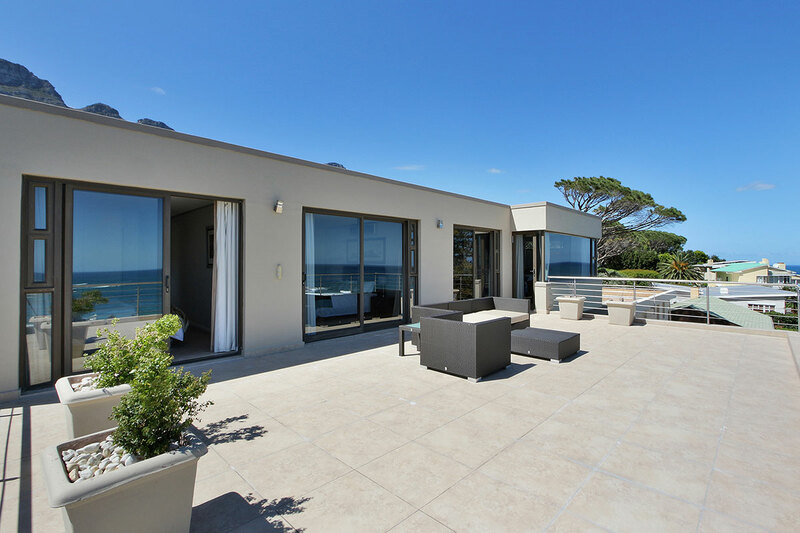 The entire length and side of this coastal villa is glass-fronted, with spectacular views of Camps Bay, Lion’s Head and the Twelve Apostles mountains behind, from the living area and rim-flow pool. 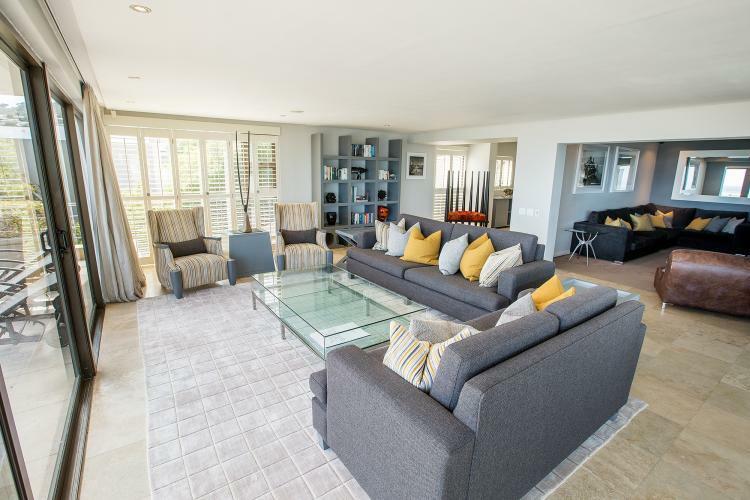 The lower level of the villa is the main entertaining area and is partially open-plan with the living and dining areas making full use of the views at the front of the house. 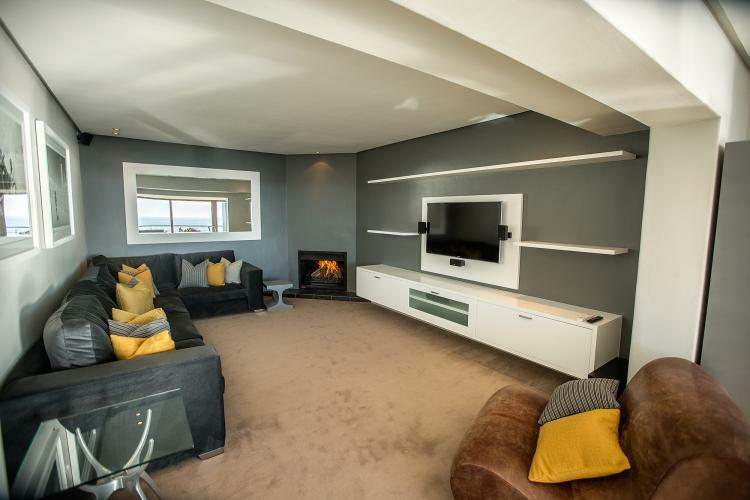 A second family room with a plasma screen and a fireplace is set back from the main living area, and the generous L-shaped kitchen and utility area runs the full length of the back of the house. 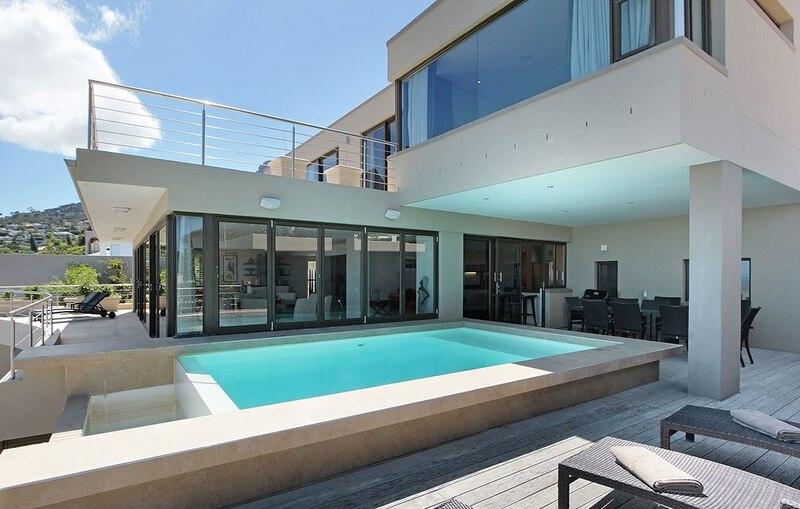 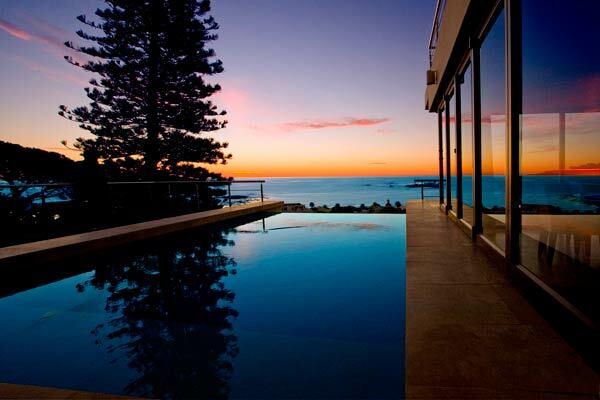 Glass doors let in the breeze and when open, the flow from inside out is seamless. 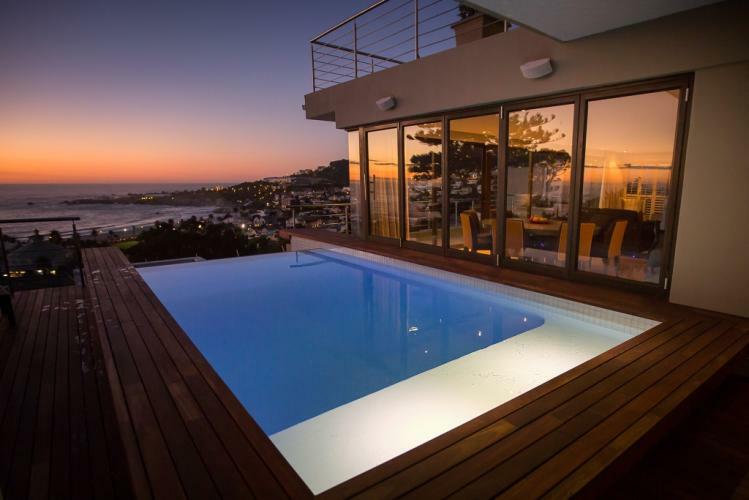 Lounging on the pool terrace is a given with these views but the evenings are particularly beautiful as the sun sets and lights begin to twinkle in Camps Bay and along the coast below. 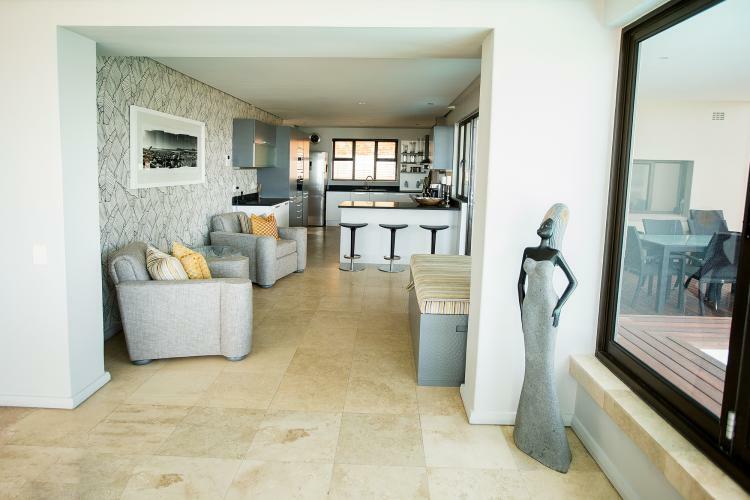 Tiled floors keep the house cool by day and the late evening light brings a warm glow into the house. Entertaining is an absolute joy in this house. 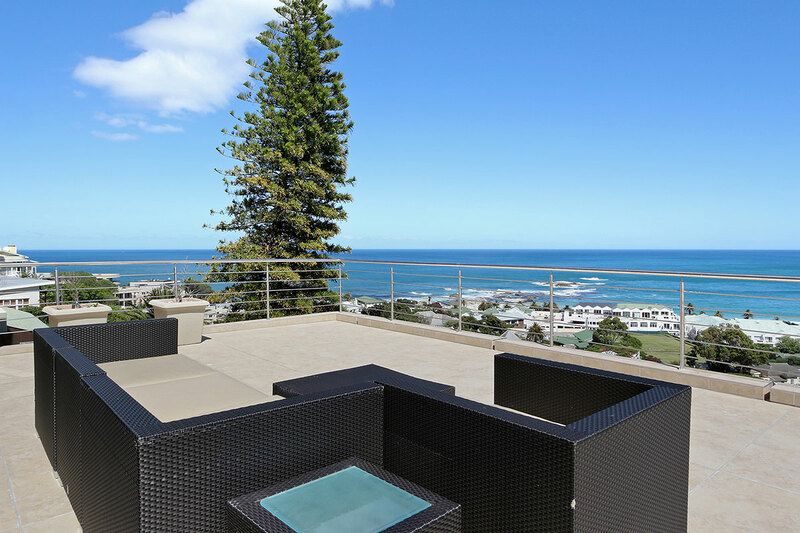 The front terrace is perfect for sundowners but even if the Cape wind is blowing, there’s ample space in the lounge for everyone to be indoors while enjoying the same view. 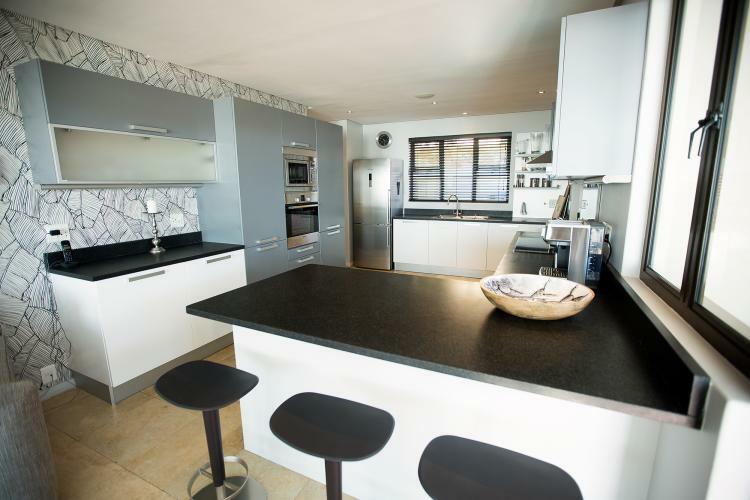 Formal dining is around an elegant black carved table with comfortable, upholstered dining chairs. 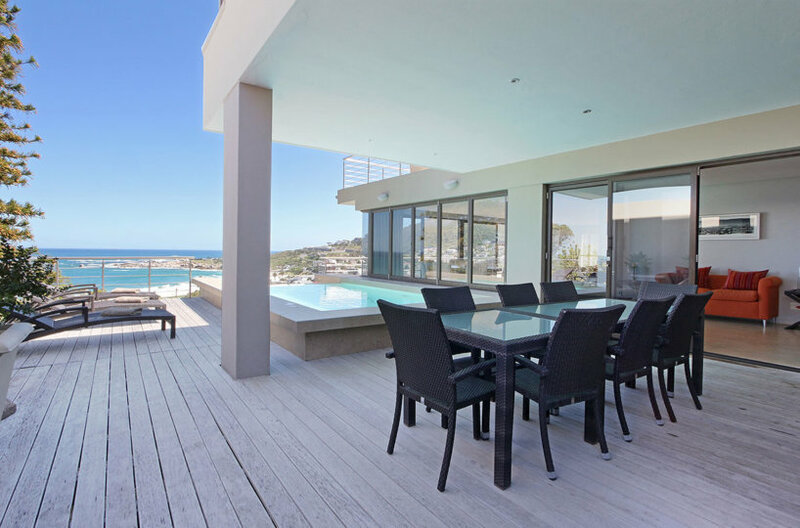 Alfresco meals are enjoyed on the sheltered pool terrace around the side of the house at a glass-topped table with matching woven chairs. 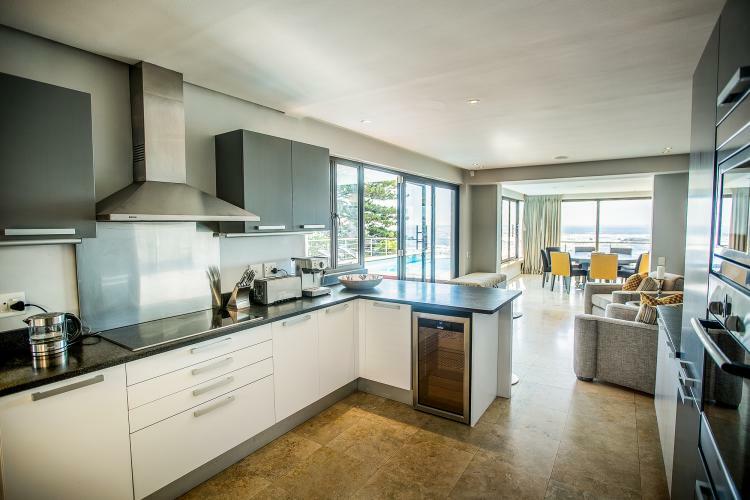 The well-equipped kitchen is ideal for entertaining, as much of the heart of the kitchen is hidden from the main living and dining area. 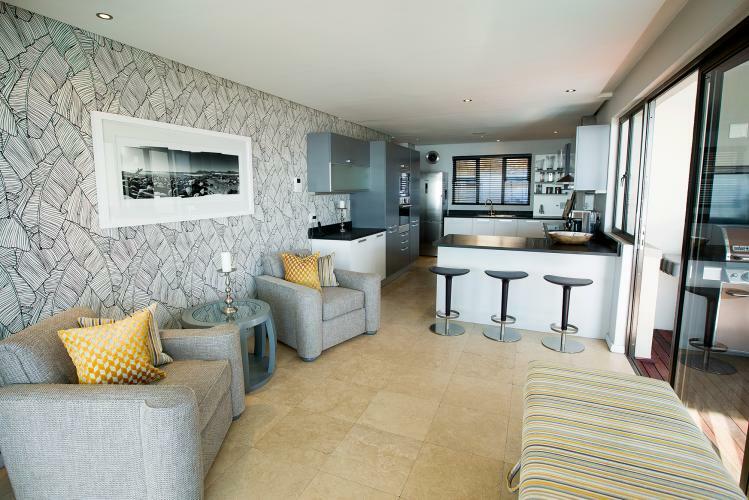 It also has loads of counter space, including a small bar counter on the entrance hall side. 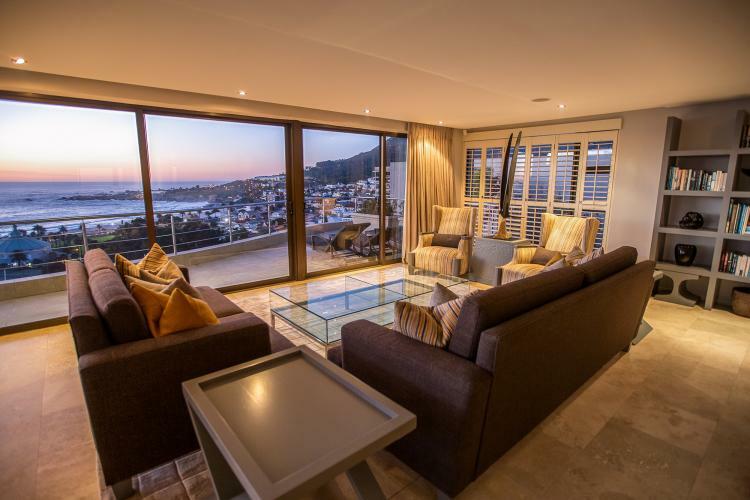 A wooden staircase leads from the entrance area to the upper level that consists of four en suite, carpeted and air-conditioned bedrooms. 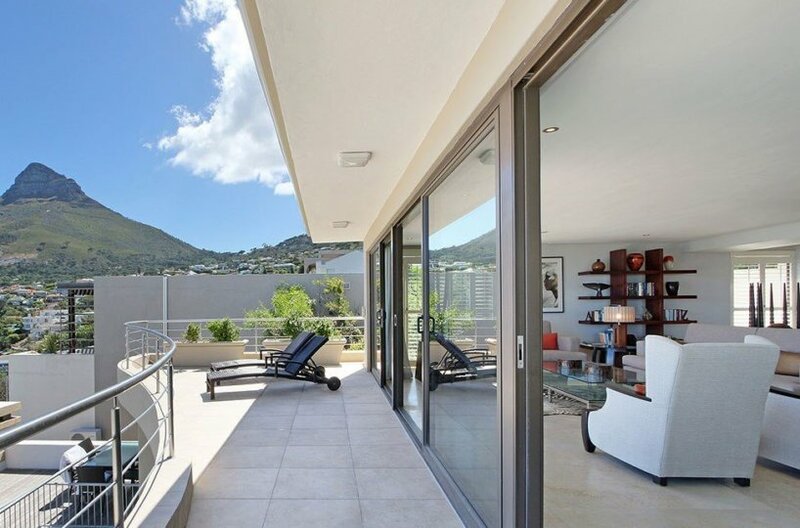 Each one has direct access through floor-to-ceiling, sliding glass doors to an outdoor terrace with equally spectacular views. 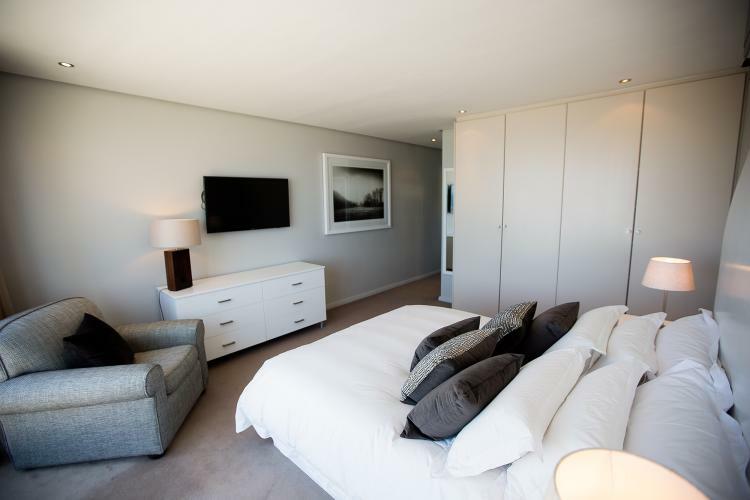 There are two queen-size bedrooms and one twin, and each has its own plasma screen and plenty of cupboard storage. 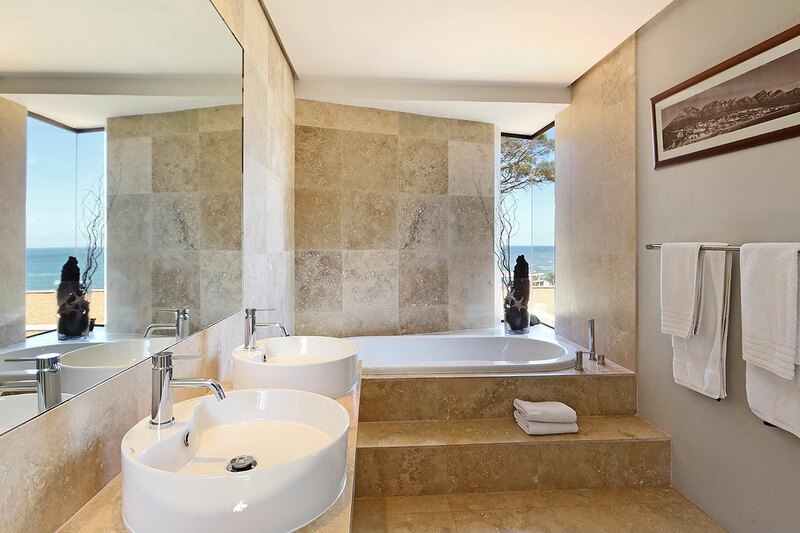 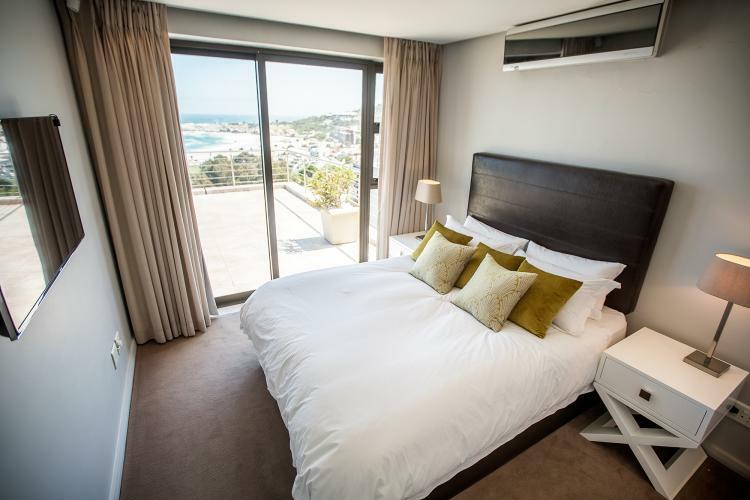 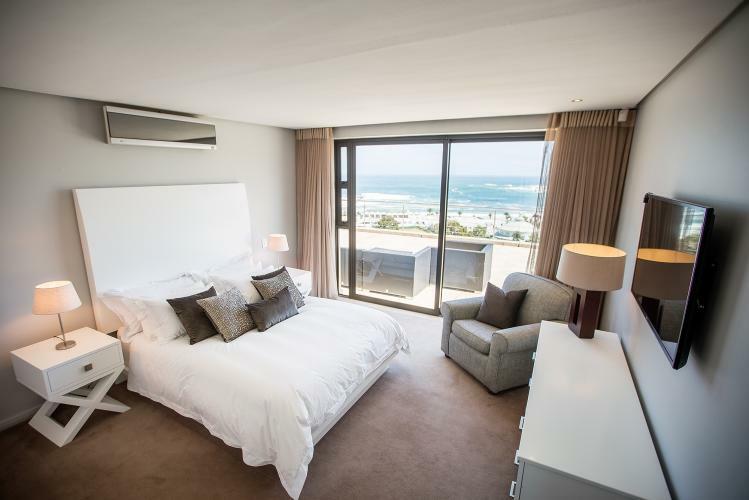 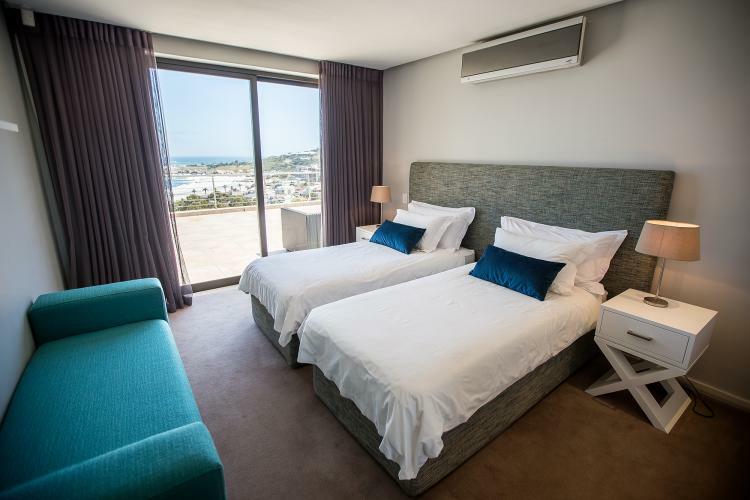 The main bedroom, with its king-size brown leather bed has its own walk-in dressing room and the generous en suite has a view of the sea from the bath, a double vanity and walk-in shower. 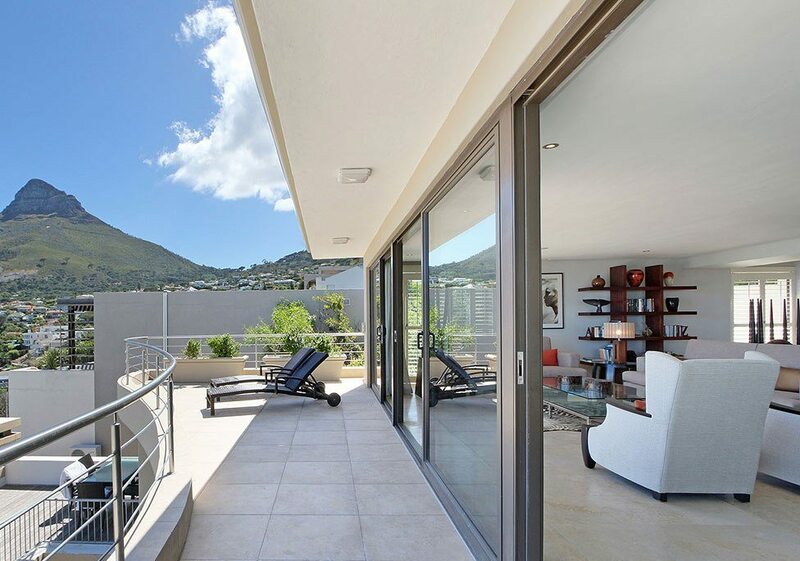 The property is accessed from Ronald Street, which is the street above Geneva Drive, and is in a private pan-handle. 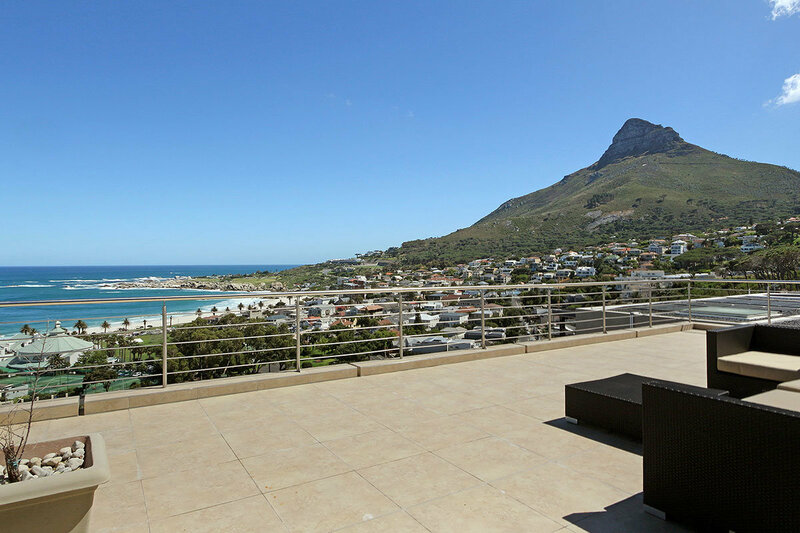 Parking is off-street for three cars and is behind secure gates. 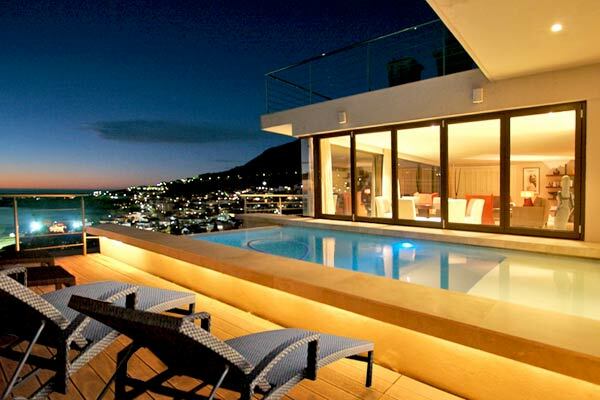 Access is through the front door of the villa.